The thing you are going to use 99% of the time with any of the providers. Amazon offers normal instances, high cpu instances, high memory instances, huge memory and cpu instances. On Rackspace you will have a very limited offer of instances. No high cpu or high memory. They do have plans to add them in nearby future. Until then, if you have a CPU bottleneck then it’s tough luck: scale up the instance and pay double. And since we are talking about pricing for instances, Amazon is cheaper on the long run due to Reserved Instances (you pay an upfront fee and lower price/hour for the instance after). Amazon has been cutting down prices several times. Rackspace? Never. Called EBS on Amazon or CBS on Rackspace, it’s the preferred way of adding extra space to running instances without upgrading them. Beware that on Rackspace it takes an horrible amount of time to do a snapshot. I had to contact RS support several times because of this. The good thing about Cloud Database is that they are fast. Really fast. Also RS promised to address all the above things in the nearby future (yeah). Rackspace does not support LB inside private network. Come on RackSpace, do your homework. This thing has been working for AWS since ancient history. There are many other things that need to be discovered, probably not pleasant ones. So far I am disappointed with Rackspace and what it has to offer and I would recommend to any customer to use Amazon instead. 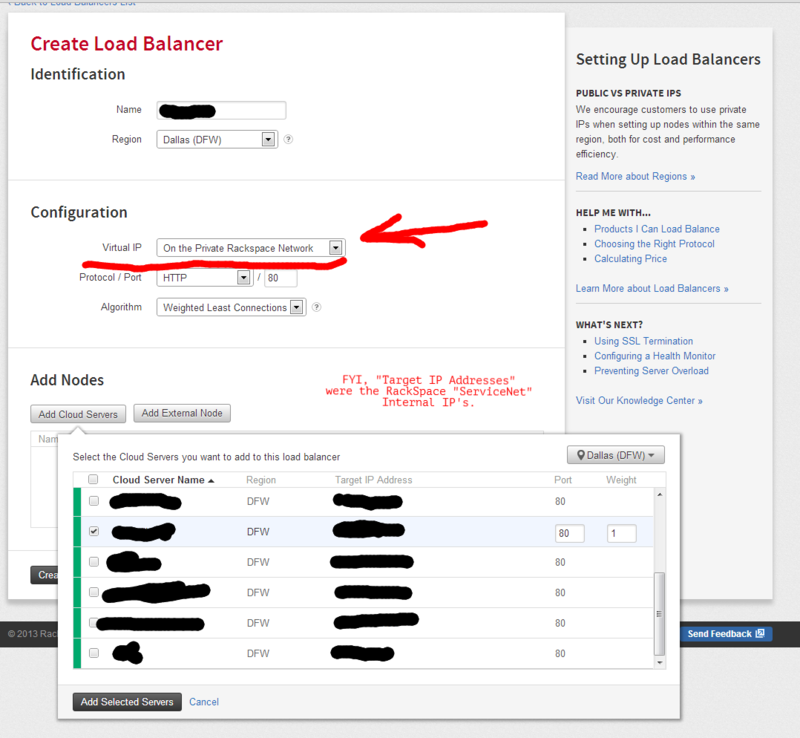 Hey dude, I don’t know if it’s changed or not since you wrote this article, but as of today, Jan 7th, 2014 it looks like Rackspace *does* in fact let you choose if a Cloud Load Balancer is inside the private network. I went to make one just now, and in the Configuration drop-down “Virtual IP”, there was an option “On the Rackspace Network”. Linked below is a screenshot so you can see. I marked out my server names and IP’s to be safe. I noted on the screenshot that the IP’s of my cloud servers I marked up were their internal “ServiceNet” IP’s, but that seems to be the case regardless of the Load Balancer “Virtual IP” configuration option I choose. Thank you for the update! They are improving things no doubt.